Security entrance door with double-glazed opaque and leaded inserts, smooth plastered and coved ceiling, smooth plastered walls all painted in neutral colours, ceiling light point, smoke alarm, double radiator, wood effect tiled flooring, feature staircase with natural wood oak banister and matching supports with glass inserts and chrome fitments, carpeted staircase, chrome light fitments and power points, telephone point. White double-glazed window to side with bevelled glass and leaded inserts, smooth plastered and coved ceiling, inset lights, fully-tiled walls in modern coloured ceramics with feature mosaic glazed border tiles, wash hand basin with central mixer tap and vanity cupboard below, heated chrome towel radiator, complementing floor tiles, low-level w.c. with concealed system. White double-glazed bay window to front aspect with decorative bevelled glass and leaded inserts, to fan lights, smooth plastered and coved ceiling, inset lighting, white double-glazed window to side, recess for wall-mounted TV and speaker, feature display inset real flame gas fire, radiator, various power points, carpeted, double size squared arch through to dining room. Smooth plastered and coved ceiling, smooth plastered walls all painted in neutral colours, wood effect tiled flooring, radiator, various power points, ceiling light point, double size squared arch to good size Conservatory. Double-glazed windows to three sides, double-opening double-glazed doors to rear garden, pitched polycarbonate translucent ceiling with thermostat for the temperature controlled automatic opening and closing ceiling vents, ceiling light/fan, wall light points, various power points, TV point, wood effect tiled flooring, radiator. White double-glazed window overlooking rear garden. Range of modern high gloss units at both base and eye level with feature shaped cabinets, wine storage, shaped pan drawers, stainless steel range cooker with complementing extractor fan above, one-and- a-half bowl under work surface “Franke” sink unit with chrome mixer tap, granite work surfaces with matching up-stand, integrated appliances include “Miele” steam oven, refrigerator and dishwasher. Under unit fan heater, pull-out breakfast bar beneath work surface, feature stainless steel lights beneath wall units, various power points with brush steel fitments, telephone point. Tiled flooring. White double-glazed door to rear aspect, smooth plastered and coved ceiling, inset lights, smooth plastered walls all painted in neutral colours. Range of fitted high gloss units with brushed steel fitments at both base and eye level, space for two domestic appliances, granite work surface with stainless steel “Franke” sink and chrome mixer tap, heated chrome towel radiator, tiled flooring, cupboard housing wall-mounted boiler serving hot water and central heating systems. White double-glazed window with leaded inserts to side, smooth plastered and coved ceiling, two ceiling light points, loft access, smooth plastered walls all painted in neutral colours, neutral coloured carpet, natural wood banister with glass inserts and chrome fitments. White double-glazed window to front aspect, smooth plastered and coved ceiling, smooth plastered walls all painted in neutral colours, inset ceiling light/fan, bespoke built-in wardrobes with push fit fitments to one wall providing hanging, shelving and drawer space, feature LED lighting above, neutral coloured carpet, wall-mounted TV bracket/point, double radiator, various power points, door to En-Suite. Above average size En-Suite, white double glazed and leaded window to side, smooth plastered ceiling with inset spotlights, fully-tiled walls in neutral coloured ceramics and feature decorative floor to ceiling tiled vertical border with designer tiles. Dual flush low-level w.c with chrome fitments, modern wash hand basin inset with chrome tap and vanity cupboard below, heated chrome towel radiator. Large shower cubicle with glazed courtesy panel and chrome trim, rainfall shower with additional flexible hose, thermostatic controls, complementing floor tiles. White double-glazed window to rear aspect, smooth plastered and coved ceiling, inset lights, smooth plastered walls. 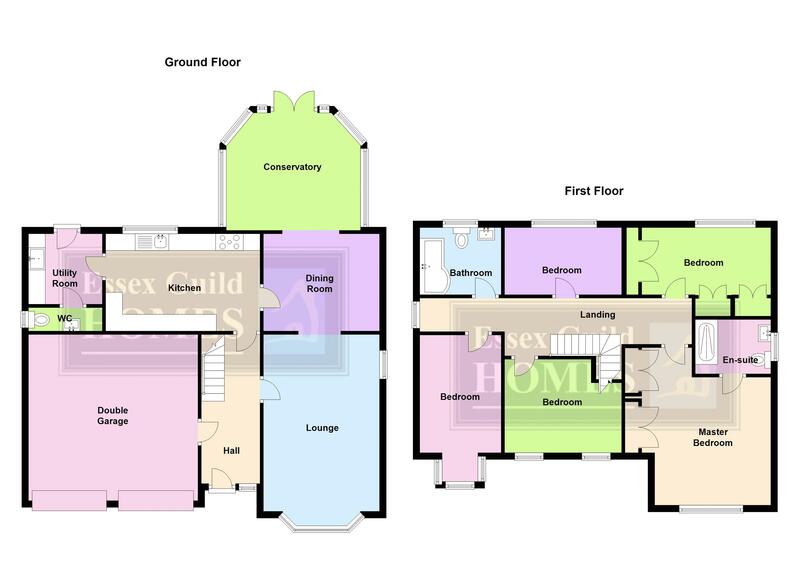 “This room currently has been fitted with wardrobes to three walls, comprising” hanging space, shelving space and drawer units, vanity area, feature lighting, neutral-coloured carpet, double radiator, various power points. White double-glazed windows to front, textured and coved ceiling, smooth plastered walls all painted in neutral colours, ceiling light/fan, neutral coloured carpet, various power points, radiator. White double-glazed window to rear, textured and coved ceiling, smooth plastered walls all painted in neutral colours, ceiling light/fan, neutral coloured carpet, double radiator, various power points. Double-glazed oriel window with leaded and glazed inserts to front, plastered and coved ceiling, smooth plastered walls all painted in neutral colours, ceiling light/fan, radiator, various power points, telephone point. White double-glazed window to rear, smooth plastered and coved ceiling, inset spotlights, fully-tiled walls with feature border tiles, three-piece suite comprising “genuine jacuzzi bath” with multi-jet system, inset shower with curved glazed panel and inset shelving, dual-flush low-level wc, wash hand basin inset with cupboard below, chrome mixer tap, heated chrome towel radiator, vinyl flooring. Shaped patio and pathway extends around the garden. Feature astroturf lawned area, well established beds and borders. Brick built barbecue and matching pizza oven to side, feature part glazed summer house and further summer house. Outside lighting, shaped brick built wall to sides, side access to front. Paved area with off street parking for three to four vehicles, Dwarf brick built wall to front and sides, outside lighting. Twin up and over doors to double space garage, power and lighting, door opening to Hallway. The Garage backs the Utility Room therefore there is huge potential to convert this room for someone needing ground floor Annexe accommodation.